Riva Self Cure range is the ideal radiopaque, self curing conventional glass ionomer restorative materials. 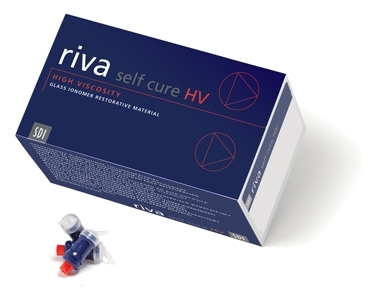 With excellent tooth adhesion, fluoride release and high compressive strength, available in two viscosities, Riva Self Cure range is useful for a wide range of restorative applications. INDICATIONS • Non stress bearing Class I and II restorations • Deciduous teeth restorations. • Geriatric restorations • Intermediate restorative and base material for Class I and II cavities using the sandwich technique • Cervical (Class V) restorations • Core build ups • Temporary fillings • Restorative in the field using the ART technique • Dentine replacement CONTRA-INDICATIONS • Pulp capping • Product may cause skin irritations to some people. In such cases, discontinue use and seek medical attention.